One goes to Yosemite for the sights, but this is not one of the more typical or expected ones. 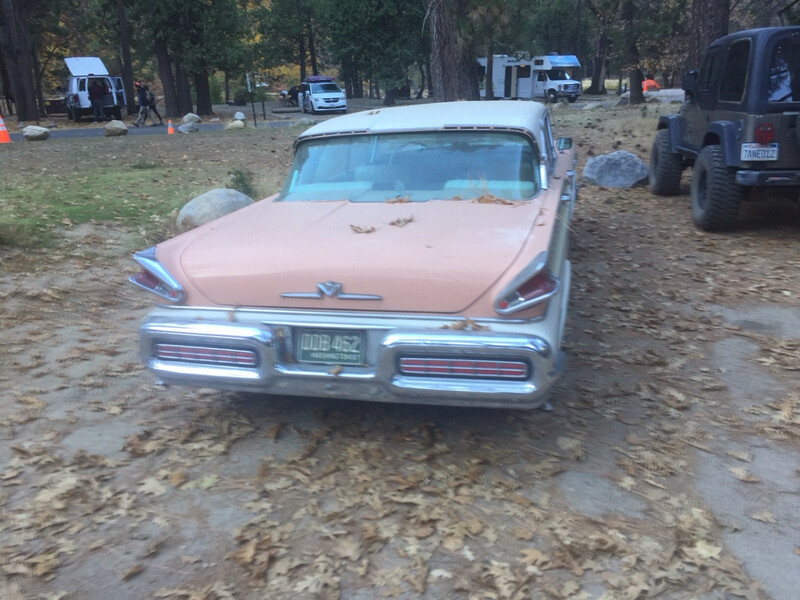 CC reader Edward H. sent me these shots of a ’57 Mercury he saw while visiting that august national park the other day. El Montclair. We just covered these ’57 and ’58 Mercuries in our ’59 Monterey CC, so I’m not going to get long-winded here. 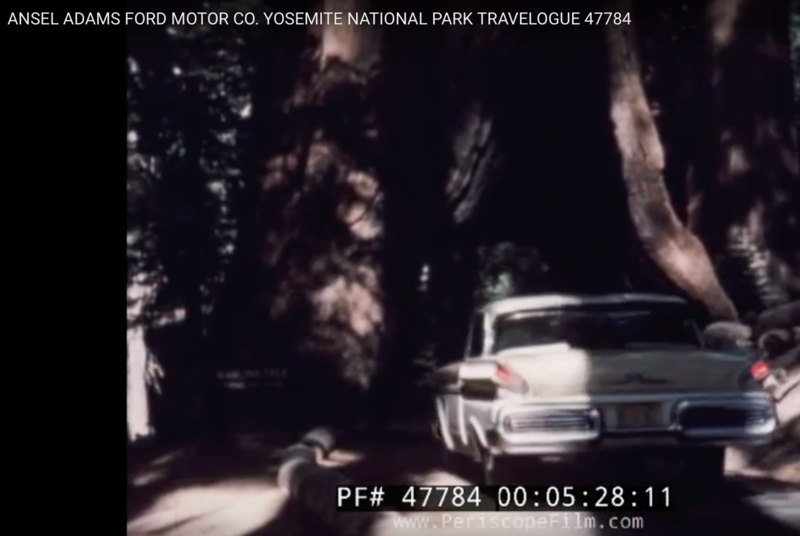 Let’s just say it probably wasn’t driven very briskly on the curving road up to Yosemite. It’s a bit fuzzy, but that looks like Washington plates to me. Now that’s a ways from home. 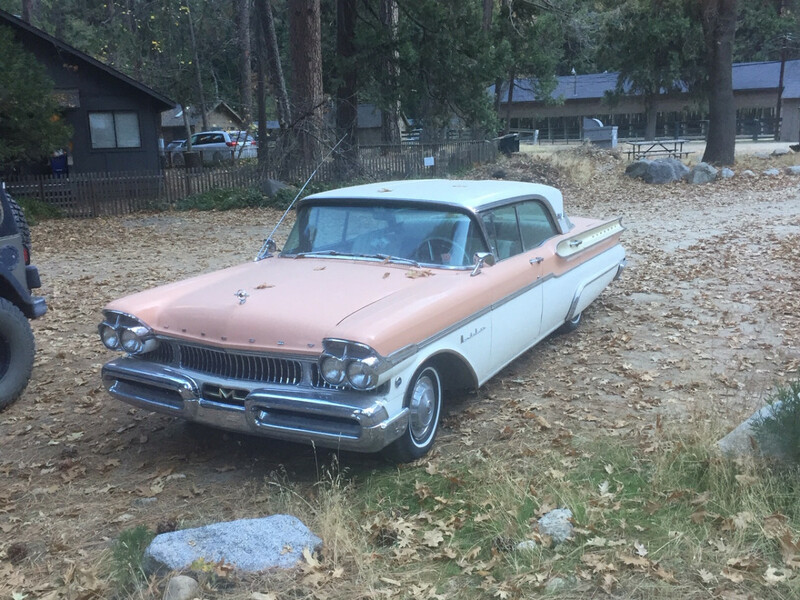 An impressive find in Yosemite. But I’d recommend not driving out via Tioga Pass. At least not without plenty of Dramamine. Is it possible the ’86 Taurus – or maybe the ’78 Fairmont – was the first mass-market Ford sedan for which handling was a virtue? I recall reading road tests which praised the 60-64 Fords and Mercuries for their handling. But I think the tradeoff was a fairly hard ride and perhaps those cars had HD suspensions or a handling package of some kine. Give me a 60s Chrysler Co big sedan before they softened things up to compete with the competition. I believe, at least from experience with our family’s 57, 59, 63 and 64 Fords that it was the rear leaf springs, as opposed to many car’s all coils, that gave the FoMoCo cars their harder ride but also better handling in comparison to their full sized peers. For its time and competition the 1978 Ford Fairmont/Mercury Zephyr were decent handlers. FoMoCo’s 4 door hardtop roof treatments during this era were a real mixed bag, but this hits me as one of its very best. If only the rest of the car could have been styled as cleanly and elegantly as the roof and greenhouse. I had never noticed how the rear door cutline goes all the way to the back of the C pillar on these. And I love the color combo. This Montclair is a lot cleaner in some of the details than the flashier Turnpike Cruiser. With some more work on the front and rear ends this could have been a really attractive car because the basic shape is quite nice. Impressive! We also found another one earlier this year but not so far from its home. They seem to be out and about based on all the sightings! Did they always sit that low or is it just saggy springs from age? Kinda like these things and I imagine that tu-tone paint job was pretty flashy in 1957. One factor is that these had 14″ wheels with much higher profile tires than you can buy now other than maybe some special retro bias ply tires. These are probably modern radials, and even the highest profile ones will lower the car an inch or so. Also in effect of course raise the axle ratio. When I had a 1962 Lincoln I wanted to switch to radial tires. I changed to 15″ wheels and got the biggest highest profile tires available in that size – I think what maybe an 80’s Cadillac would have. I got wheel covers for a 70’s Lincoln and removed the black plastic center, which ended up looking a lot like the original ones. In 1964 (stretch of the same body) Lincoln changed to 15″ wheels but the wheel covers they used were very different. Anyway with what I did the odometer and speedometer stayed exactly correct. We used to belong to the Bethlehem Steel swimming club which was in Dundalk, and when going there in summertime as a kid I recall seeing a lot of non-mainstream cars in the many used car lots along North Point Blvd on the way. Not sure why that would be, but always lots of Mercurys and DeSotos and Nashes and the like, none of which were to be found in our neighborhood full of more common Chevs, Fords, Buicks, Olds, and Chryslers. I was always struck by the odd rear lines of the ’57 Mercs, which looked nothing like our ’57 Ford. 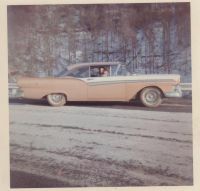 Many hours spent as a 4-yr. old in the drivers seat of my grandfathers ’57 Montclair. ……. pressing every button in reach …… best of all was the push-button transmission. But Gramps was always complaining about frequent replacement of the dual exhausts. Could this be Grampa’s old Montclair? If so, it woulda been a long way from the Bronx to Yosemite. But, who knows? Miss ya Grandpop, and missing the space age Merc! The Tioga Pass is perfect for me and my Lotus! you can thank Stephen Mather for that. Under other circumstances, you might have been able to get a “moon over full dome” photo! OK, these didn’t corner like modern cars but they did drive on all those same roads with the same speed limits we have today. Compared to a ’53 Buick these would be real handlers. 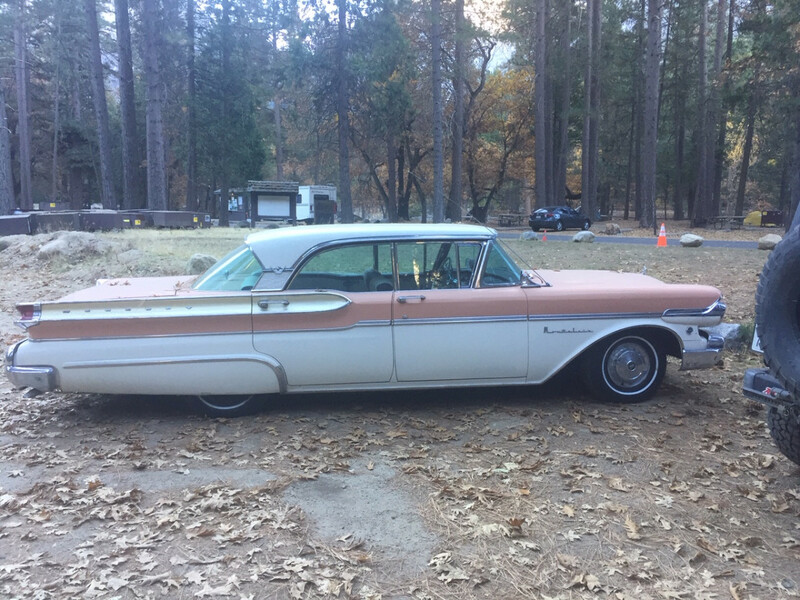 My 1962 Lincoln handled fine (with obviously lower limits than a new car). OK, it was a unit body unlike this Mercury. And because of typical leaf spring sag over 40 years it had overload shocks with the coil spring over them to bring it up to level, so probably a bit stiffer in the rear so a bit less under steer. Braking on the other hand…. Not even close on the roads. This car went on sale a few weeks after the Interstate Highway System was first funded. When this car was built, the road to the center of town from my current neighborhood (which was a field then) was two lane county roads and plain city streets. Now it’s six lane streets and eight lane Interstate with a max speed limit of 70. That color combo looks familiar. 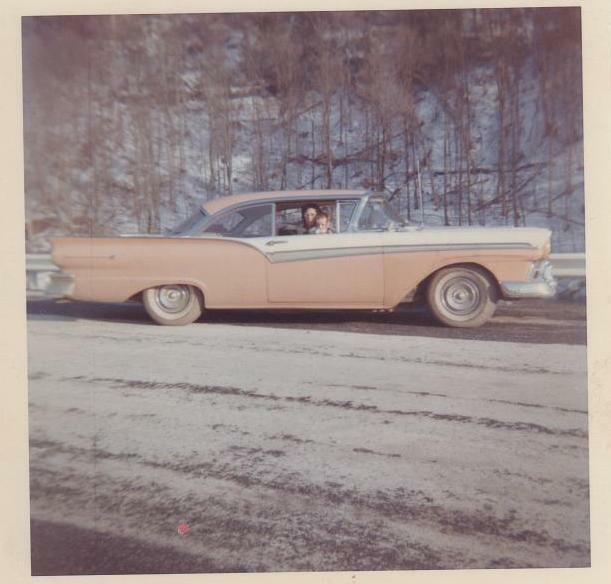 Here it is on my dad’s ‘57 Fairlane 500. Ford called it Coral Sand & Colonial White. The picture is from 1963. Oh, Wow—-CC Time Machine effect! I love the 57-58 mercury’s. But the tires have to go. First, the 14 inch factory rims (5X5 bolt pattern btw) are too small for a full sized car. And then add (relatively) low profile narrow band white wall radials? I’m cringing over here. 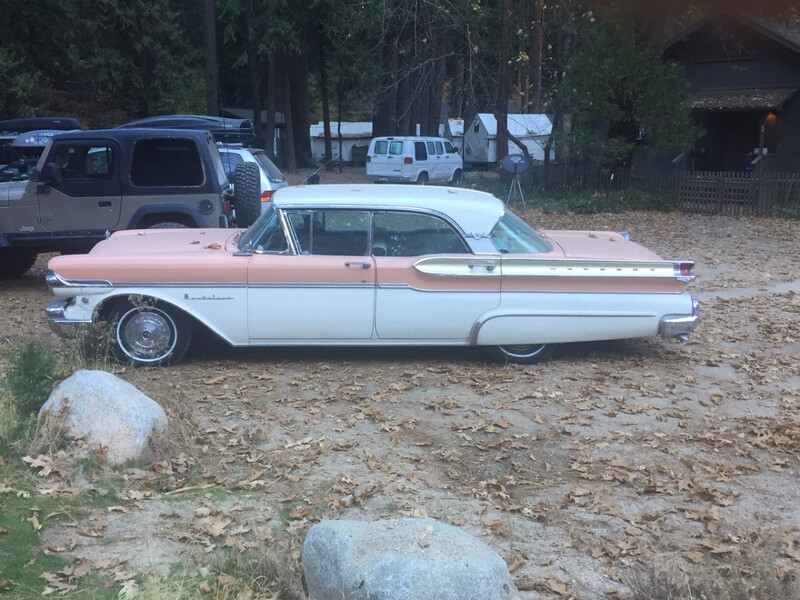 I own a 58 Edsel Corsair and the first thing to go were the small rims and tires. I actually know the owner of this car! It belongs to a park employee. I’m a former employee myself, and I’ve seen this car around for years. I would not want to drive this barge on those mountain roads!